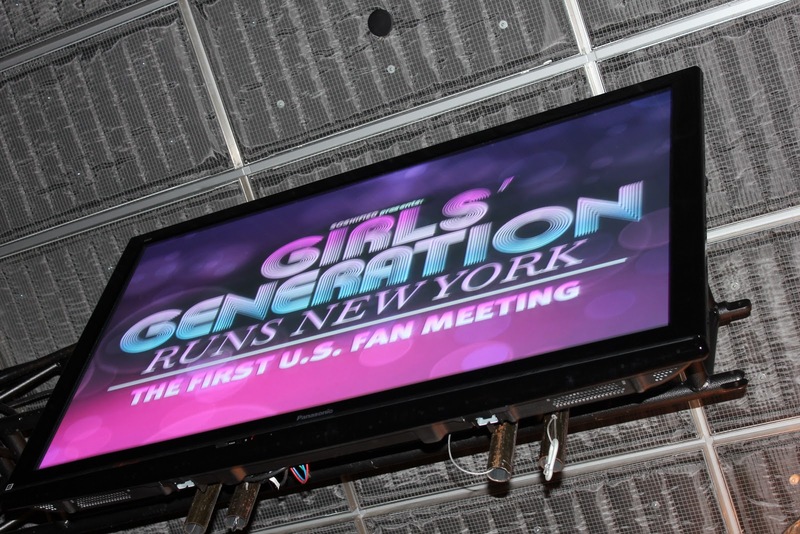 On Monday, October 24, 2011, the nine-member South Korean female pop group, So Nyuh Shi Dae or Girls' Generation held their first fan meeting in the United States organized by Soshified.com at the Best Buy Theater in Times Square. At the SMTownLiveNY concert, the night before Girls' Generation, along with Kangta, BoA, TVXQ, Super Junior, SHINee and f(x) performed their hit songs to a sold-out Madison Square Garden Arena. The home of the Knicks was transformed into the familiar SMTown concert arena with the Y-shaped stage extending out into the mosh pit. The producer of their new hit single, The Boys, Teddy Riley was in attendance at the concert, and during our conversation, he wondered aloud whether anyone ever expected that a K-Pop concert in New York would sell out at Madison Square Garden. Teddy had a huge smile on his face and one could feel a sense of pride in the SM artists and the hard work it took to put together a successful concert. GG enthusiastically performed The Boys at the concert, and this was a prelude to their performance at the intimate gathering at Best Buy Theater the following day. The fan meet was scheduled to begin at 4:30pm and by 1:50pm, the line had already tracked 44th street and all of Broadway and was half way down 45th Street. The security at the event was very attentive to the fans and kindly kept us in neat clusters so we did not block the entire sidewalk or entrances to various buildings. Many fans who were in line spoke exchanged stories from the weekend about close encounters with various SM artists, including SHINee and Super Junior. Everyone seemed excited to see the girls in person. Soshified.com staff stamped our hands with a red "S9", and a Soshified.com staffer kept a counter which read 547 before 2:00pm! The line continued to grow and spanned the length of 45th Street. Fans shared pictures and accounts from the concert the night before. Many mentioned that they had seen the artists walking around Times Square. It was easy to see that these artists are adored by U.S. fans as fans shared favorite YouTube clips of K-Pop artists on their cell phones. The line began to move as early as 4:15pm and by 5:00pm the vast majority of the fans were inside the Best Buy Theater. At 5:15pm, the lights dimmed and a video began to run. Fans enthusiastically sang along to Into the World, Kissing You, Oh!, Gee and Tell Me. Soon the girls performed The Boys. The fans were chanting along and cheering for the girls. It was easy to see and hear the happiness from the fans, and the girls responded in kind. The fans were most enthusiastic when the bridge of the song, "I wanna dance right now..." was sung. Many had memorized the song already and were singing along. After this performance, the girls introduced themselves to the fans. As the MC began to speak and told the girls just how much their fans love them through a slideshow, the audience noticed Taeyeon wiping her face with her hand. The fans let out a collective "We love you Taeyeon" to let her know she could feel okay crying here. Tiffany then said that GG had worked very hard on the album The Boys and are really overwhelmed by the love they are receiving from U.S. fans. It is easy to see why these girls are so loved. Soshified.com staff prepared some interview questions and the girls eagerly participated. Sooyoung showed one of her famous impressions of a girl who speaks Korean with an American accent and spoke very well in English. Sunny showed off her famous aegyo and enthusiastically waved to the fans throughout the event. Seohyun was asked to give us advice, and she responded while giggling: "Fasten your seatbelts." Jessica sang to the fans in English, and Hyoyeon performed a brief tutorial and dance from The Boys. Yuri was asked to speak in English because fans love how she speaks English and she said "I love so much". When Taeyeon cried at the beginning, her tears humanized GG. Since their come back stage a few days before in Korea they seemed to have been working constantly since the release of The Boys MV. It's not unlikely that they were not sure whether they would receive a warm reception from fans and experiencing such a hearty welcome from American fans (and fans from Mexico, Canada, and Korea!) may have made them feel as though their hard work was not in vain. At the end of the event, the MC mentioned to GG that the audience had a gift for them - cupcakes from Magnolia's Bakery and a song. The audience broke out into song, the chorus from GG's debut single Into the New World and the girls joined in. After they sang with the fans, they said thank you and waved at everyone. The event ended 6:20pm and many fans made their way over to the hotel where the girls were expected to return after the fan meeting. The excitement was palpable even standing outside the hotel. My conversation with producer Teddy Riley the night before came to mind and I wondered whether anyone believes K-Pop can make it in the U.S. It's been tried before. It seems easy to dismiss the potential for success of K-Pop in the U.S. when one considers that Girls' Generation are not the first to debut in the largest music market in the world. Artists, including, BoA and the Wonder Girls have debuted in the U.S. and have not experienced similar success as they did in Korea. There is a healthy fear among GG fans that GG may not make it in the U.S. without, at minimum working with producers and musicians that are well-respected in the U.S. music industry. Also, GG has to be carefully managed in order to capitalize on the enthusiasm about and interest in their K-Pop and in the girls themselves. The U.S. music market is big and fickle. Success in the U.S. market depends on many intangibles including the mood of American teenagers. The girls are personable and show enthusiasm to their fans when they perform. They are beautiful and well styled. They have a concept that works well in the U.S. They have chosen to debut here with a simple pop song that may appeal to many American teens and tweens. Their song The Boys is just as catchy as any American pop song and Teddy Riley's production gives the song a Britney Spears/Pussycat Dolls feel. Their performance, including their military attire is reminiscent of early Destiny's Child and the lyrics are easy to learn. The English is not perfect, but GG has time to polish their English skills. To be sure, GG's or any artists success in any market is never guaranteed, but following up the debut with a huge concert like SMTown live was a great marketing move. SMTown served as a great advertising campaign for the girls and even got them on several screens in Times Square, and the New York Times reviewed the concert! I don't think other artists who debuted in the U.S. have had similar exposure. Following their debut with the traditional K-Pop fan meeting was a great idea because it assures GG's core fanbase that they may be marketing themselves in the U.S., but their K-pop flavor will be preserved. The reason why K-Pop fans love, K-Pop is because it's not American Pop - it's similar, but there's something different about it. K-Pop idols get on crazy shows and act silly, play funny games, talk about their crushes, troll on Twitter, and in general they don't seem to spend a lot of time "pretending to be cool", and as a fan, I'd like to keep it that way. Also, K-Pop outfits are pretty quirky - when artists aren't trying to be overly cute (see the video above that was playing on the MTV-K screen in Times Square). It'll be nice if this type of style, especially more edgy style like G-Dragon and TOP of Big Bang would be retained if K-Pop becomes anything close to mainstream. Girls' Generation seem to desire success in the U.S., as do many other K-Pop artists, and with a lot of luck, and a ton of hard work, GG may just be the artist to create unprecedented crossover-appeal from Korea to find success in the U.S. I just hope they don't lose the qualities that make them so appealing to K-Pop fans.